Frequent on roadsides, waste ground and as a garden weed. ID: Leaflets do not end in a point like Black Medick. Petals persist in fruit, folded about their midrib over the pod rather than folded down flat over it as in Hop Trefoil. 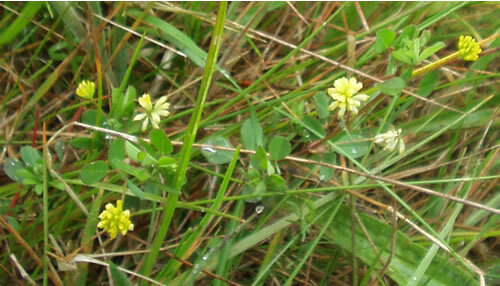 Other features: The smallest and commonest of the three yellow-flowered clover-like plants. Flowerheads normally have 10-20 flowers. An opportunist annual.